Shepherd’s Pie Potato Skins! Making this my “express” way, it takes just 15 minutes to prepare to pop into the oven to get those gorgeous brown crunchy bits on the mashed potato! As a potato-obsessed-carb-o-holic, I take great interest in any potato related dishes. However, with potato skin recipes, the thought that always crosses my mind is, “what shall I make with the potato I scoop out?” That’s why I love making these Shepherd’s Pie Potato Skins. It’s efficient. And there’s a double potato hit. Win, win! Here’s a bit of food trivia for you: Shepherd’s Pie vs Cottage Pie. Do you know the difference? 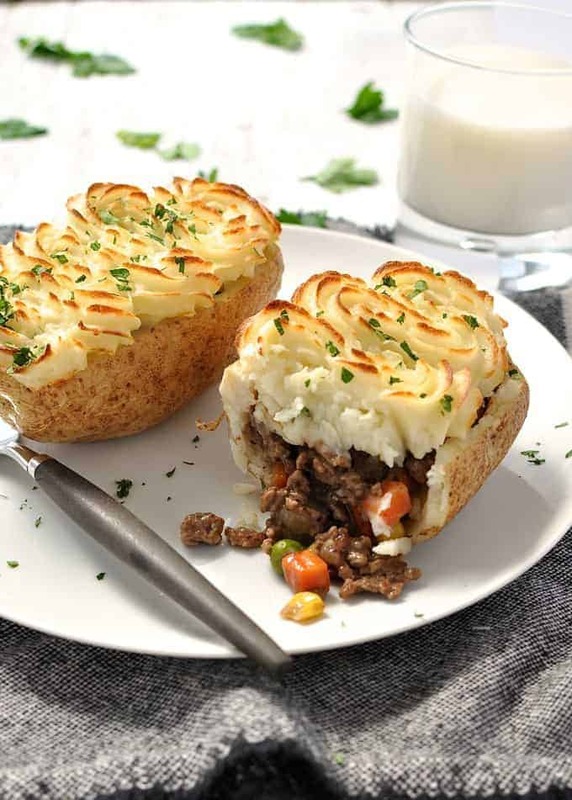 The recipe is the same – a mince filling topped with mashed potato. 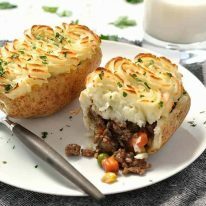 The only difference is that Shepherd’s Pie is traditionally made with lamb mince whereas Cottage Pie is made with beef mince. I always get the names confused! I first saw this Shepherd’s Pie Potato Skins recipe in a Women’s Weekly magazine way back in the 90’s. Well, not this exact recipe because I make the filling “my way” which is super fast. And a few weeks ago I saw it on Instagram and it prompted me to make it. The Instagram post was by Christina’s Cucina, a Scots-Italian food blogger based in LA. I mean, with that bloodline, how could you not be a great cook, right?? So thanks Christina, for reminding me of this!! I made a bit of an effort to make these Shepherd’s Pie Potato Skins pretty by piping on the potato, but ordinarily I would just dump the potato on with just a spoon. It doesn’t impact the flavor at all. Just fluff up the potato with a fork and you pretty much get the same amount of brown crunchy ridges. Secondly, I make my Shepherd’s Pie Potato Skins filling using frozen mixed vegetables (corn, peas and carrots). A decade ago I never would have done this, but nowadays the frozen vegetables are really great for dishes like this. Saves a whole lot of chopping! But if you prefer to use fresh vegetables, feel free to substitute! I am not sure what moment is better – when it’s fresh out of the oven, ready to dig into, or that moment when you cut through the golden crunchy top through the creamy mashed potato and the filling oozes out…..What do you think?? 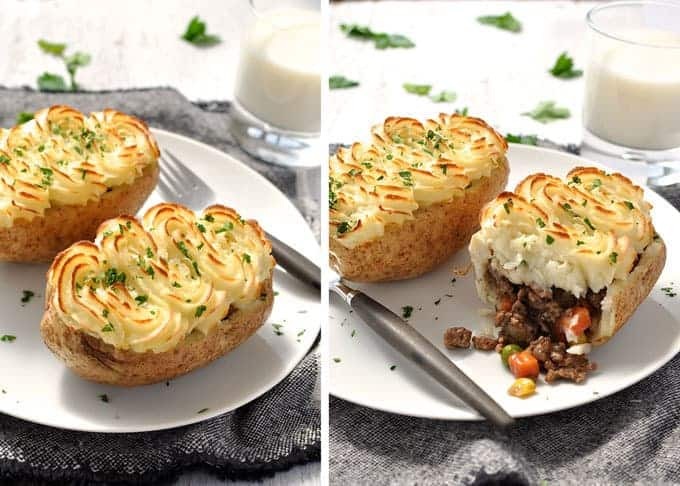 Don't save the potato you scoop out for another dish - mash it and pile it on top to make these irresistible Shepherd's Pie Potato Skins! Prick the potatoes with a fork (about 6 times on each potato) and microwave on high for 5 minutes. Then turn and microwave for a further 5 minutes. Pierce with a knife to check if they are cooked. Remove from microwave (use a dish cloth). Cut off the tops and scoop out the center using a spoon, leaving a fairly thin skin (about 0.5 cm / 0.2”). Place the potato scooped out in a bowl. Add milk, butter and salt and mash with a potato masher until smooth, or to your liking. If you want to pipe the filling, place the mashed potato into a piping back with a large star tip nozzle. Meanwhile, make the filling. Heat the olive oil in a large fry pan over medium high heat. Add onion and garlic, sauté for 2 minutes until softened. Turn up heat to high. Add mince beef (ground beef) and cook, breaking up the mince as you go, until nicely browned and cooked – about 3 minutes. Sprinkle over flour and stir to combine. Add remaining ingredients and stir to combine. Bring to simmer and continue to stir until the sauce is thick and glossy – around 2 minutes. Fill each potato with the Filling so it is slightly heaped. Push down lightly to pack the filling in well. Pipe over the mashed potato, or scoop it on with a spoon then fluff it up with a fork. You probably won’t use all of it – save the remainder or serve it on the side. Place in the oven and bake for 15 to 20 minutes until the mashed potato is starting to brown on the ridges. 1. This freezes really well. Freeze after baking for best results, otherwise the mashed potato sticks to the cling wrap. To reheat, thaw then bake (to get the top crispy again) or microwave. 2. 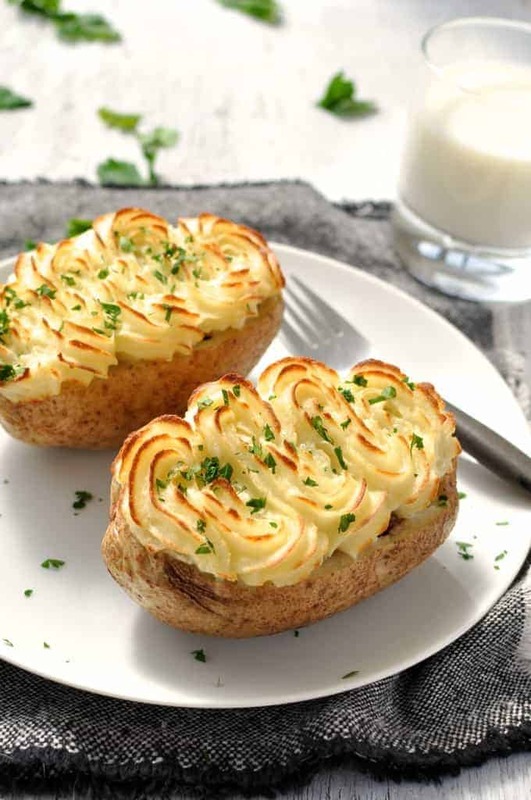 You can bake the potatoes if you prefer, rather than microwaving them. They will take around 40 – 50 minutes at 180C/350F. 3. If you are in a real hurry, you can skip the step of baking and just brown the top under the grill/broiler. But note that the baking gives the Filling time for the flavours to develop as well as browning the top. 4. You could also sprinkle some grated parmesan cheese on top of the mashed potato. Adds even more crunch and flavor! 5. 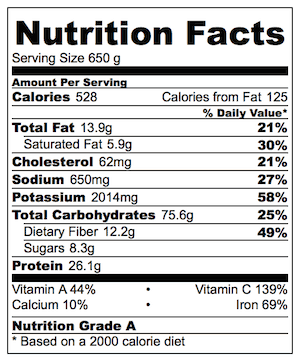 The Nutrition Facts assumes that you use all the potato scooped out for the topping. But actually, you probably won't so the actual calories per serving are less. Made this dish but instead of ground beef and lamb I filled it with pot roast then covered with mash potatoes and sprinkle with grated cheddar cheese. Yum!